Ansonia " EXCELSIOR" Model Crystal Regulator, c. 1910 Case: Great detail. Original "RICH GOLD" finish and bevelled "Plate Glass". 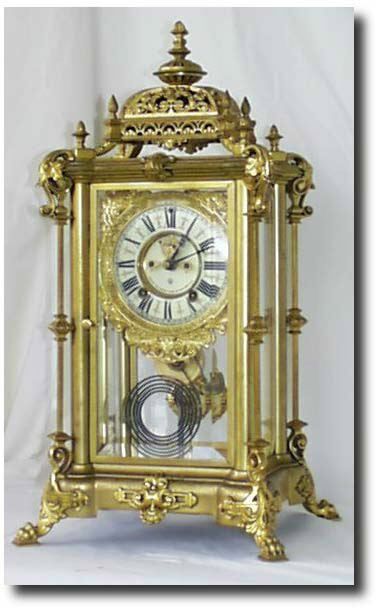 - 20.5" high Works: Ansonia 8 day brass with hour count and half hour striking on gong. "Best quality 20th century Ansonia shelf clock works I have ever seen" (comment from dealer) Visable escapement with jeweled pallets. 100 percent original. This is one of the most expensive shelf clocks in the old Ansonia catalogs. Reference: Ansonia Clocks by Tran Duy Ly Condition: Case: The case is great. Not over polished. Most of the original gold finish is still present with normal dark spots from cared for aging. Works: excellent, cleaned and lubricated. Pendulum. As shown P.117 Plate 323 of the new "Ansonia Clocks and Watches" by Tran Duy Ly.